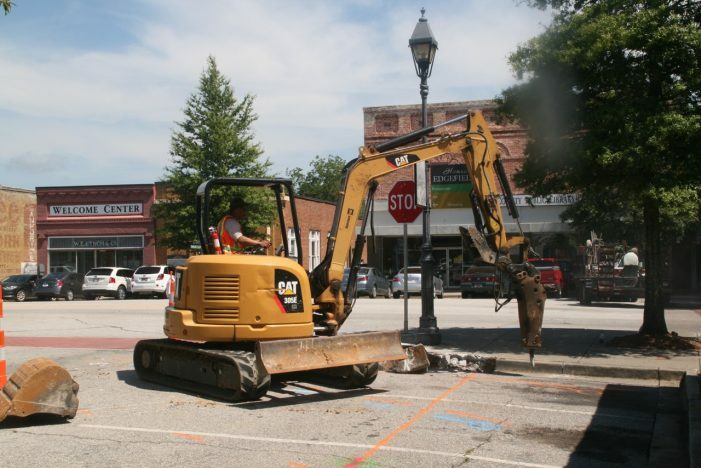 The equipment rolled into town today, August 7, to begin the destruction and reconstruction for the Improvement Program for the Edgefield Town Square. It is starting at the site of Park Row Restaurant, a popular sandwich/delicatessen/bistro. The widening of the sidewalks is their goal at this point. Business owners came out to take note of the beginning, a schedule that had been changed several times but not anymore – it is on the way! The Town is encouraging folks to make a point to shop and eat on the square during this time to keep business going, in spite of the inconvenience at times. There will always be a way to enter the business, no matter the construction outside. Visitors are welcome at this time. The area of constructive is selective and once finished the engineers will move to another spot.